Marinating food adds to the flavour, texture and smell to dishes. Marinades are especially popular for barbecues but they’re also great for indoor cooking. 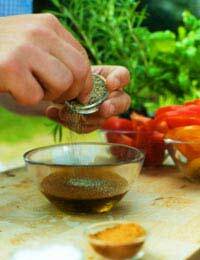 When you marinate food, you soak your food – often meat, fish or vegetables – in a seasoned liquid. Marinating is popular in all sorts of international cuisines, such as Caribbean cooking and Indian food. Marinating can make a big difference to your cooking but to get the best results you need to plan ahead to some extent as the longer you can let your ingredients marinade, the richer the flavours will be. You usually need between an hour and six hours for a marinade to work. This marinade is suitable for most meats, fish and vegetable. You can also marinade cheeses such as paneer, halloumi and goats’ cheese. Blend all the ingredients together, except the oil, then stir the mixture into the oil. Allow meat, fish or veg to marinate in the mixture overnight. Spicy marinades are very popular. Try this and adjust the heat to suit your tastes. Just mix all the ingredients together and marinate. This recipe is versatile and particularly suits chicken, fish and steak. Yoghurt marinades work especially well on chicken and lamb. Try this one on chops or chicken legs. It’s a great tenderiser, as well as adding flavour. Leave the meat to marinate for at least two hours. Don’t marinate in aluminium containers – use glass, ceramic or plastic.